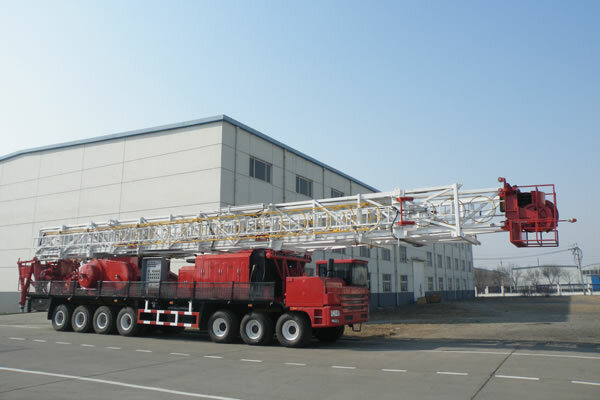 The truck mounted drilling rigs put all parts of power system, draw-works, mast, traveling system and transmission system on the self-propelled chassis. It has the characteristics of heavy workload, reliable performance, strong cross-country ability, convenient for transportation, low cost for operation and moving. The truck mounted mechanical drill equipment series are with the drilling depth of 1000m, 1500m, 2000m, 3000m and 4000m, which can adapt to middle and shallow well drilling operation. We can also design rigs applicable to cold, desert, plateau and other special environmental requirements of customers. 4. The truck has good cross-country and driving performance, which can satisfy the complicate conditions of oilfields. 1. The rotary table transmission case can achieve forward and reverse shift and adapt to positive and negative buckle drill pipe rotation operation. 2. The rotary table transmission case is equipped with anti-torque release device to ensure the safe release of the drill pipe deformation energy. 3. The draw-works and rotary table can be electric driven. 4. The main drum uses integral Lebus rope groove to reduce the wear of the wire rope and effectively extend the service life of wire rope. 5. The main drum can adopt band brake or hydraulic disc brake. The auxiliary brake can adopt pneumatic water cooling disc brake or pneumatic tong type brake, water brake or eddy current brake. 6. Sand drum is optional. 7. There are many user friendly designs applied, including the new cab, new power steering, automatic locking pin of the mast, crown block and draw-works centralized lubrication systems, telescopic mast in place warning system and brake cooling system. 8. 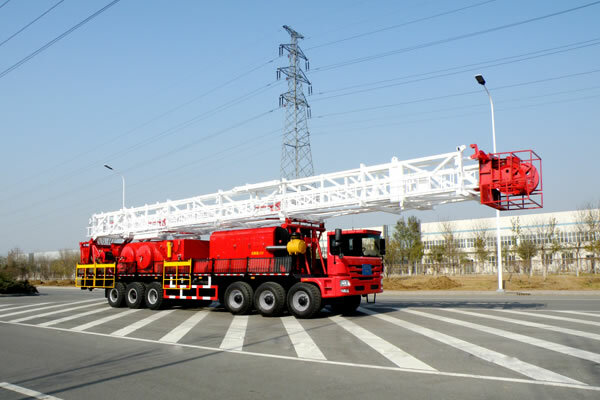 The substructure is two-part telescopic type or parallelogram structure, easy for transportation and lifting. The size and height of the substructure can be designed according to user requirements. 9. Ambient temperature is from minus 45°C to 50°.